"I want to get the most power out of my stock bottom end, what head gasket and studs will I need to make my car reliable?" The one-two combination of our VAC Head Gasket and exclusive ARP Hardware is unbeatable! Compatible with both standard, and sleeved engines, our gaskets are made to our own specs based on thousands sold and the results have been spectacular. 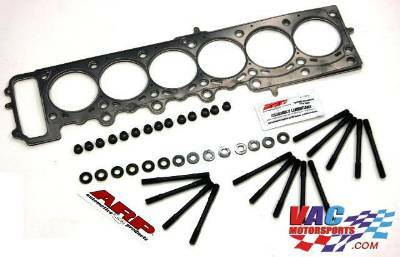 Of course; this kit is also works perfectly for the naturally aspirated tuners among us that want ultimate reliability from the head gasket: just select the .070 or .080 thickness that fits your needs, or call/email us with your questions. Select what engine you have and what thickness head gasket you would like from the drop down menu and you will get your Forced Induction solution in one box.